The Scotch Malt Whisky Society (SMWS) is releasing three peated single cask whiskies to celebrate its presence at Islay Festival of Music and Malt. For those travelling to the Islay Festival of Music and Malt (Fèis Ìle 26 May – 3 June 2017), SMWS will launch three special single cask Islay whiskies exclusively at the event. The bottles will be available, while stocks last, online at www.smws.com and at the Society’s UK venues from Thursday, 1 June. However, those attending the festival will have early access from Friday, 26 May. The whiskies making up the trio of single cask Islay whiskies are called ‘The Crowd Pleaser’, ‘Sweet Smoke on the Water’ and ‘Jazzy Jousting Hastlitude’. 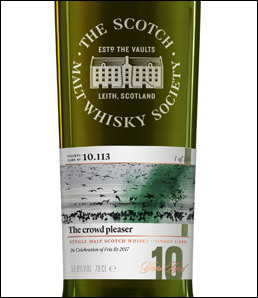 ‘The Crowd Pleaser’ is a 10-year-old whisky from a second-fill ex-bourbon barrel from the Society’s Heavily Peated flavour profile, described as having notes of “old first aid kits and sweet hot smoked salmon”. Only 186 bottles are available. ‘Sweet Smoke on the Water’ is 20-years-old and matured in a second-fill French hogshead. From the Society’s Peated flavour profile, it claims the whisky has notes of “smoked duck and ribs with sticky glaze”. Only 252 bottles are available. The oldest of the three, ‘Jazzy Jousting Hastlitude’, is 21-years-old and matured in a first-fill American oak Pedro Ximenez hogshead. Again from the Peated profile, SMWS describe this whisky as having hints of “tarte tatin, treacle toffee, herbal smoke”. From one of the whisky world’s most iconic distilleries, only 228 bottles are available. All three bottlings will be available at some of the Society’s partner bars in France and Germany, which will be offering special Fèis Ìle-themedwhisky flights and hosting events in celebration of the festival. More information on these events can be found at www.smws.com/events. In addition, the Society’s branches in USA and Australia will also be staging special Feis Ile tastings over the course of the Islay Festival to celebrate the festival and the release of these new whiskies. Those attending the festival will be able to purchase the bottles at three ‘Flavour of Islay’ events hosted by the Society at Islay House, Bridgend throughout Friday, 26 May. These separate masterclasses will feature tastings of different local produce in order to investigate the importance of flavour, which lies at the heart of the Society’s approach to whisky. The first pairing is a peaty SMWS whisky with 100% Ecuadorian, organic Pacari chocolate. The second takes a local approach to the old tradition of drinking a ‘Hauf an' a Hauf', by matching three whiskies with Islay Ales. Finally, later in the evening, the drams are paired with half a dozen local oysters.